Question: My rose plants are full of huge rose hips. How can I extract the vitiman C. I'm pretty sure that I'm suppose to be pruning before they are allowed to form, but it happens . What are other uses of roses and how can I take advantage of them? I appreciate any information you can give me on roses, nutrients and how I can benefit from them. J.B., Richardson. Answer: After the fruit, which you correctly call hips, are red and mature in the late summer or fall, chop them up for the salad or add to them to the hot water in making herb tea. Answer: Rose hips are safe when dry. They are ready to harvest and use after they have turned red and are fully matured on the plants. They are a wonderful source of vitamin C and are most commonly used in hot tea at a rate of 2 tablespoons of chopped rose hips per pint of near-boilingwater. 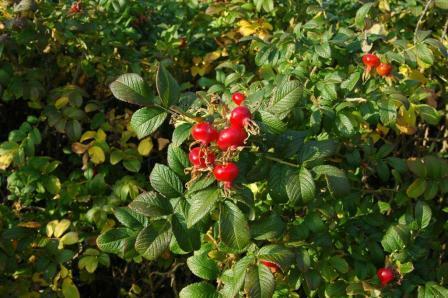 Don't use rose hips in food or drink unless they were grown with organic techniques; pesticides collect in the reproductive parts of plants.